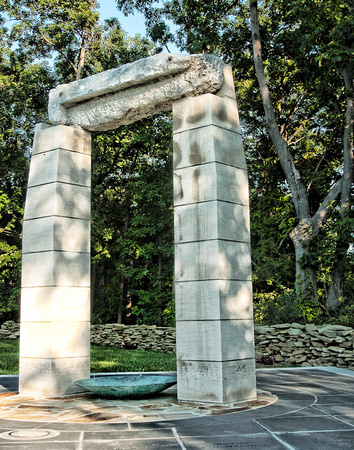 Pictured (left) is the An Gorta Mor memorial located in the Irish Hills, Michigan. Pictured (right) is an 1847 sketch of Irish potato farmers in County Cork by artist James Mahony (1810–1879). 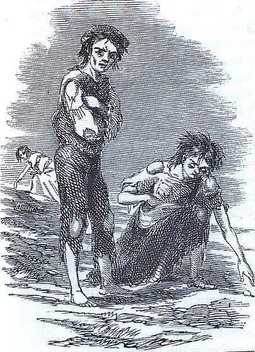 The Great Famine (Irish: an Gorta Mór) or the Great Hunger was a period of mass starvation, disease, and emigration in Ireland between 1845 and 1852. It is sometimes referred to, mostly outside Ireland, as the Irish Potato Famine, because about two-fifths of the population was solely reliant on this cheap crop for a number of historical reasons. During the famine, approximately 1 million people died and a million more emigrated from Ireland, causing the island's population to fall by between 20% and 25%. The proximate cause of famine was Phytophthora infestans, a potato disease commonly known as potato blight, which ravaged potato crops throughout Europe during the 1840s. However, the impact in Ireland was disproportionate, as one third of the population was dependent on the potato for a range of ethnic, religious, political, social, and economic reasons, such as land acquisition, absentee landlords, and the Corn Laws, which all contributed to the disaster to varying degrees and remain the subject of intense historical debate. The famine was a watershed in the history of Ireland. Its effects permanently changed the island's demographic, political, and cultural landscape. For both the native Irish and those in the resulting diaspora, the famine entered folk memory and became a rallying point for various Irish Home Rule and United Ireland movements, as the whole island was then part of the United Kingdom of Great Britain and Ireland. ​The massive famine soured the already strained relations between many of the Irish people and the British Crown, heightening Irish republicanism, which eventually led to Irish independence in the next century. For more information on An Gorta Mor, go to the AOH National website by clicking here.